Places to see in Ravangla: The calm and serene surrounding of Ravangla, admired with high-forested mountains will offer you a true romantic escape. The location is dotted with a number of old monasteries, the most notable being the Ralong Monastery and the Ravangla Monatery. The holy cave of Shar Chok Bephu is also worth visiting. You can also trek to the Maenam Wildlife Sanctuary, admired with lush green forest of magnolia, chestnut oak and rhododendron. The sanctuary is also the refuge of some endangered species like Himalayan Black Bear and Red Panda. Nearby attractions around Ravangla: There are a number of attractions around Ravangla. Ralong, located 8 km from Ravangla is a popular sunrise point, offering splendid snow view, especially during the sunrise. You can also organize a tour to Sikip, nestled on the riverbank of River Rangeet, renowned as a rafting campsite and a fishing spot, amidst the scenic natural surrounding. There is also a Hot Sulphur Spring, located 34 km from Ravangla, which also features two holy caves, Khandosangphu and Sharchog Begphu. You will be amazed to see the towering heights of the Tendong Hill and the Maenam Hill, famous for trekking. You can also organize short village tours to the nearby Lepcha and Bhutia villages of Tinkitam, Yangang and Barfung. Temi Tea Garden, Pelling, Richenpong and Pemyangtse are all located nearby. Things to do in Ravangla: Ravangla is an ideal site for trekking and enjoying the splendid views of the eastern Himalayas. You can trek to Meanam from Ravangla, which takes nearly about 4 hours. The Tedong Hill also offers a nice trek along the forested hilly region. 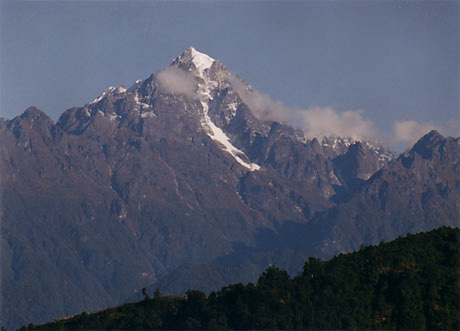 Ravangla is also an ideal destination for the avid bird watchers. Above all, enjoy the panoramic sight of Mt. 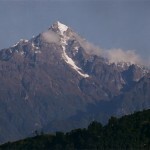 Kanchenjunga, Mt. Siniolchu, Mt. Pandim and Mt. Kabru from Ravangla. How to reach Ravangla: Ravangla is accessible from all prime spots of Sikkim, which include Gangtok, Pelling and Namchi. It can also be reached from Darjeling. The nearest railway station is New Jalpaiguri in West Bengal. You would get rented cars from the New Jalpaiguri Station to Ravangla. You can also get rented cars from Siliguri and Bagdogra. Best time to visit Ravangla: You can visit Ravangla at any time of the year. However, you can avoid the rainy season, for landslides are frequent at that time. Summer is pleasant and winter though chilly is enjoyable. Lodging and dining facilities in Ravangla: You can find a number of nice resorts and hotels in Ravangla, offering decent accommodation and dining facilities.